Are you interested in self-publishing print books? If so, we have researched several options for you to consider below. But first, here is a list of items to consider when choosing a self-publishing option for your print book. The publishing industry is always changing and so as it does, we plan on continuing to update this post for you. Some authors simply want someone else to manage their book project. In this case, you will pay more to have your book published, but you will not have to invest the time into managing outsourcers, budgets, deadlines, etc. There are many companies that offer this service. However, their fees are usually very high. We typically recommend self-publishing through your own publishing company. If you are willing to put in the time and effort to learn how to publish a quality book, there are several affordable self-publishing options available. Each option below offers print on demand services. This means that when a book is ordered, it is printed. This eliminates the need for stocking inventory, which lowers your overall costs. You only pay for what you need. CreateSpace is a company owned by Amazon that offer authors the ability to self-publish print books. Find out more details about royalties here. Expanded distribution is now free, but previously cost $25. This changed after Ingram Spark was launched (see below). For the expanded distribution, there is a 60% of list price for all options below. More about expanded distribution here. Details about CreateSpace ISBN’s here. Ingram Spark is a service provided by Lightning Source for small, independent authors and publishers. From the research I did, there seems to also be a $40 fee every time you need to to update your file, but I recommend verifying that with Ingram Spark. More on Ingram Spark’s Fees and Revenues. Lightning Source is another option available and is a step up from Ingram Spark with more options available. I have heard it is harder for independent authors to get approved for a Lightning Source account unless you have at least 20 titles. But, you can always try. You can sign up for an account ($49 set up fee) here. Another approach is to use a publisher that give you the control that you get with self-publishing, but offers the quality and distribution that you get with traditional publishing. Morgan James Publishing provides entrepreneurs with the vital information, inspiration and guidance they need to be successful. A division of Morgan James, LLC, Morgan James Publishing, The Entrepreneurial Publisher TM, is recognized by Publishers Weekly as one of the nation’s top publishers and is reported as being the future of publishing. Shelley has personally met the owner of Morgan James Publishing, David Hancock, and has been impressed with him and his team and several of our colleagues have published books with them successfully. We highly recommend them if you are looking for a publisher but want to maintain more control of your book and get higher royalties. Entrepreneurial Vision Mastermind with David Hancock, CEO of Morgan James, Publisher Rick Frishman, Publishing Director Jim Howard and Marketing Director Bethany Marshall to help you plan the books strategy, including 40 hours of virtual assistant time to help you get started. Long term thought leadership and strategy on a continual basis, you will have regular access to marketing strategists. Visit MorganJamesPublishing.com to learn more. Did you know that you can choose more than one option? As long as you have a universal ISBN, you are able to distribute your book using all three options mentioned above in the self-publishing section. For example, you can use CreateSpace to publish your book on Amazon, Ingram Spark or Book Print On Demand to distribute your book to bookstores via the Ingram catalog, and Book Print on Demand to buy copies for live events and sell books from your website. Also, if you have previously published on Amazon with a CreateSpace ISBN, you can purchase a new universal ISBN and publish the same book through IngramSpark in order to get your books in book stores. Therefore, you will have your book published through CreateSpace and IngramSpark at the same time with different ISBN’s. This way you can keep your book published with the CreateSpace ISBN on Amazon so you don’t lose your sales momentum. How Do I Get My Print Book into BookStores? It is expensive – you have to give 40-55% of your profit right away. It is very competitive – there are thousands of titles competing with your book. It works best when there is already a demand for you book and you have built your book marketing platform. 52% of books are sold online. Therefore, I recommend that you start by selling your book in online bookstores first. Once you have built a platform and have success selling your book at a local or regional level, then you can consider distribution to bookstores on a national level. Otherwise, you may spend a lot of time pursuing something that yields very little return on investment (ROI). 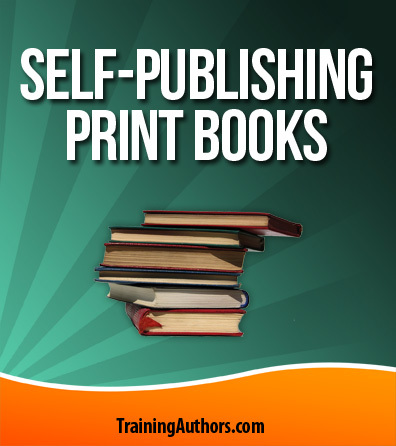 There are multiple options available to authors who wish to pursue self-publishing their print books. You no longer have to fill your garage full of books, go into debt, or hand over all of your rights to a traditional publishing house. You can self-publish your book! We also have posts about self-publishing eBooks and audiobooks.